This activity is our speciality with 26 years experience and our own shooting schools based at Luton Hoo Hotel Golf and Spa and Old Park Farm, Toddington, Bedfordshire - M1 Junctions 10 and 12, 35 and 45 minutes from London City centre. We can arrange to pick you up from Luton Parkway (Luton Hoo) or Harlington train station (Old Park Farm) Bedfordshire, First Capital Connect, 2 minutes away. Review our Luton Hoo Clay Pigeon Shooting Page. Lee Leisure Entertainment caters for Individuals as well as large and small groups. We are so confident at what we do, that to our knowledge we are the only company that offer a money back guarantee that we will get you to hit targets. 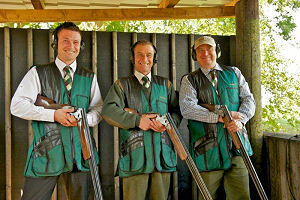 Clay Pigeon Shooting can also be booked at most of the venues listed on our Web Site. Other event organisers often book Lee Leisure Entertainment as specialists for Clay Shooting activities, ensuring their clients receive the highest standard of instruction and tuition. 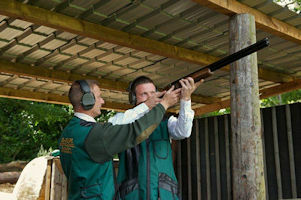 The numbers of people participating are divided into groups, (maximum 6 people), and allocated to a qualified and experienced instructor who will teach shooting methods and techniques. Master eyes are checked and guns are fitted to each person so that everybody stands an equal chance. Concentration, determination and enthusiasm all come in to the equation. Clay Pigeon Shooting is recommended as an ideal choice for both ladies and gents. Guns and shot loads are professionally selected to suit each and every individual ensuring a comfortable and enjoyable experience that you will talk about for years to come. Your instructor will be with you at all times to help advise and answer any of your questions. Individuals and small groups are also catered for, which makes it an ideal choice for stag parties and hen parties normally catered for at Old Park Farm. Purchase our gift vouchers for friends and relatives for clay shooting and archery. We also offer an excellent mobile event service. Further activities can be found on our all activities page.